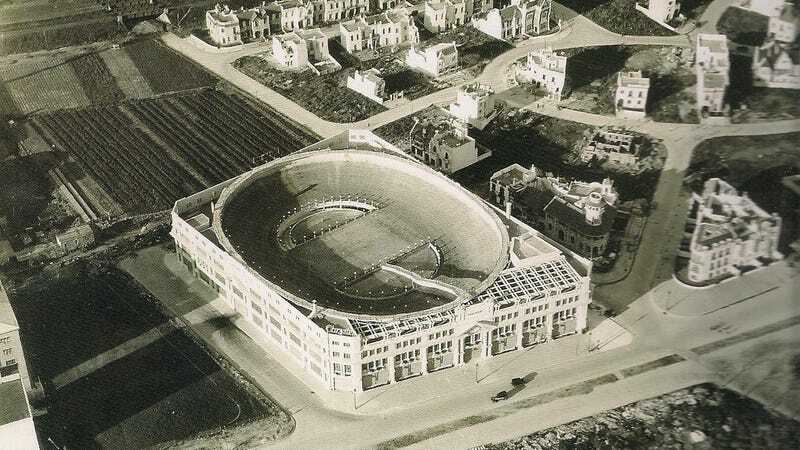 In 1928, five years after Chrysler's current part-owners Fiat inaugurated their stunning Lingotto plant, Chrysler's Argentine distributors opened a magnificent building to assemble, test, sell... and race cars in Buenos Aires. We went to take a look at what remains. Figueroa Alcorta and pass the only building with a rooftop test track in South America without knowing it. Palacio Chrysler was built by the company of Argentine entrepreneur Julio Fevre, who had acquired the exclusive right to represent Chrysler in Argentina in 1927 after a decade and a half of importing American cars into the country. The building was designed by Mario Palanti and occupied an entire city block in what was then a rather sparsely built-up area of Buenos Aires. Period photos show the building tower over townhouses and empty land. The column-lined facade housed an exhibition area, while the back and upper parts of the building were used for administrative offices, workshops, and storage areas. But it was the upper deck that stole the show. Equipped with a test track of slightly over a mile long, it was used for testing cars and inviting the high society of Argentina to look at them: the inside of the track had a capacity for 3000 people. history—with the help of my lovely co-explorer Natalie Polgar, who translated my English into the doorman’s porteño Spanish across a bridge of Italian—he would not let me past the front door and definitely not onto what remains of the top of the rooftop test track, which Google Maps shows demolished, converted into a ground-level swimming pool for residents and an oval, domed roof. What the doorman didn’t count on was the roof deck of the Latin American Art Museum of Buenos Aires, immediately next door to Palacio Alcorta. Buy a ticket and ascend to the top floor, where you can see just a hint of the curvature of the rooftop oval, a secret artifact from an age when the automobile was new and art and poetry, swarming into the world from buildings not anonymous bricks but magnificent temples to the gods of speed. Go see it! Then get a steak and ice cream. Special thanks to Jalopnik reader Guillermo Flynn for bringing Palacio Chrysler to our attention. You can read more about the history of the building in a forum post at ForoEnfierrados.com (in Spanish).